But they sent some Pharisees and supporters of Herod to him, so that they could entrap him in his speech. They came and said to him, 'Teacher, we know that you are sincere and that you don't bother what other people think of you. You don't judge on appearances, but you teach the way of God truthfully. Is it lawful to pay the poll tax to Caesar? Should we pay it or not?’ Fully aware of their hypocrisy, he said to them, 'Why are you trying to test me? Bring me a denarius. Let's look at it.' They brought one and he said to them, 'Whose is this image and inscription?' They said, 'Caesar's.' Jesus said to them, 'Give to Caesar what belongs to Caesar, and to God what belongs to God.' They were amazed at him. One day, he gathered all the country’s religious leaders together and asked them a question: ‘Who is greater, God or I? You have until tomorrow to come up with a satisfactory answer.’ The priests and ministers were very frightened. 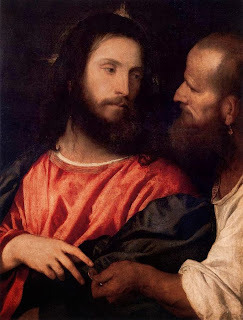 They knew that if they answered as their conscience told them to answer they were running the risk of banishment from the kingdom, and perhaps even of execution, and yet they did not want to betray their calling by simply giving in to the king’s vanity. Here was a dilemma indeed! ‘What can we say?’ they were asking each other, as they left the palace. Some were shaking with fear; others were weeping, thinking of banishment to some far off land, life-long separation from their homes and families. There’s no doubt that this is the most miserable time of the year. Christmas lifted our spirits a little – the lights, the evergreens, the carols, the jingles, the shopping, and the presents all contributed to an easing of the burden of winter. And that, of course, is their function. Christmas comes when it does in order to counteract the general feeling of gloom that the long nights and the cold weather inevitably bring. To our ancestors, who lived without central heating, electric lights or television it would have been an almost unbearably dreary and even dangerous time. In the darkness entertainment is limited, and you can’t see the predators; in the cold people die. This is the time of year when people suffer from the aptly named SAD - seasonal affective disorder - when lack of sunlight can bring on depression and feelings of hopelessness, and even in those of us whose moods don’t change quite so dramatically there is a general feeling of contraction, in sharp contrast to the expansive optimism of the springtime. This is not all negative, of course. Winter has its own beauty and its own range of pleasures. Hot drinks, blazing fires, snow, frost, can all delight us, as they give us permission to slow down a little, to lie fallow like the earth, to recover our energies for the next burst of activity which is only a few months away. In addition, winter makes us conscious of our vulnerability, and of our reliance on each other for the smooth continuance of our lives. In the summer we feel invincible, but things can go very badly wrong now, so we need people around us to share the burden of the darkness. On our journey round the zodiac circle we have had occasion to mention that one of the symbolic bases for our understanding of the individual signs is their relationship to the light or the darkness. The light represents individual consciousness, the darkness symbolises the collective, so when the light is strongest – from the spring equinox to the summer solstice, from March to June, - the signs of the zodiac symbolise emerging individuality, separateness. When darkness prevails, as it does now, and we need to huddle together for warmth and safety, the signs symbolise group consciousness, the community, the state even. These are the very themes which the ancient astrologers associated with Capricorn, which the sun entered on 22nd of last month. 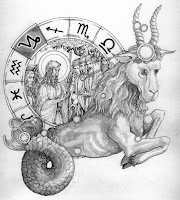 Capricorn symbolises the relationship of the individual to social and political organisations, and the most ancient symbol of Capricorn was not the mountain goat, but the goat-fish, a mythical creature which lives in two environments, just as human beings live both a private and a public life. So writes Joan Hodgson in her engaging little book Wisdom in the Stars, and we can supplement her insights with a few observations of our own. The Capricorns I know are generally serious people, often ‘old beyond their years’, even in youth. They tend to be responsible, cautious, prudent, quietly ambitious, industrious, sometimes with a sense of constantly fighting a tough battle against life, as if, somehow, they have chosen to follow a hard and stony path, but like the mountain goat, which is their symbolic animal, they continue to climb relentlessly to the top, undeterred by obstacles. They are conscious of status and so can be deferential to authority while expecting deference from those who stand beneath them on the social ladder. England is said to be heavily under the influence of Capricorn, as is India, and both of these countries have age-old systems of social stratification which seem quite ridiculous to outsiders. The English reserve and concern for propriety are parodied throughout the world, and there’s an old joke about two Englishmen who were washed up on a desert island. Ten years later a ship picks them up; they are living on opposite sides of the island and have never spoken to one another. ‘Why didn’t you get together?’ asks the incredulous ship’s captain. ‘We haven’t been introduced,’ was the reply. 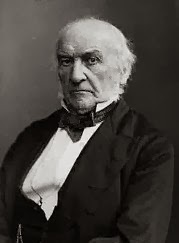 A typical Capricornian figure was the 19th Century English politician William Ewart Gladstone. Born on 29th December 1809, he was one of the hardest working and most productive politicians of all time. In addition to running the British Empire, he translated and wrote commentaries on the classical authors, and even found time to ‘save’ fallen women. He would roam the streets of London at night, meeting with prostitutes, attempting to rescue them from their life of vice. He was called, in true Capricorn style, ‘The Grand Old Man’, and his manner was so formal that Queen Victoria said, ‘He always addresses me as if I were a public meeting’. When he was 85, he bequeathed £40,000 and many of his books to found a library and, despite his advanced age, he himself hauled most of his 32,000 books a quarter mile to their new home, using his wheelbarrow. The Roman Saturnalia was celebrated as the sun passed into Capricorn and was a riotous celebration marked by acting in defiance of everything that Saturn stood for: traditions and customs were overturned; authority figures were ridiculed; conventions and laws were suspended. 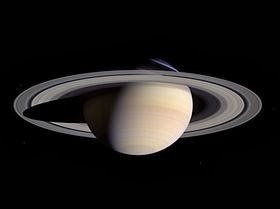 It was the Roman way of cocking a snook at Saturn, of squeezing out a few drops of pleasure from life before the dourness of winter set in. The section begins, appropriately for Capricorn, with a question about the source of Jesus’ authority, a question which he very cleverly avoids. Then some Pharisees and Herodians ask him whether it is right to pay taxes to Caesar, to the Roman state. What is often overlooked by commentators is the implausibility of this combination of inquisitors. The Pharisees were patriots, committed to reclaiming Palestine from Roman rule. The Herodians were collaborators, supporters of King Herod who was a puppet ruler, put and kept in place by the Roman overlords. It would have been as unlikely for Pharisees to mix freely with Herodians as for the U.D.F. to associate with the I.R.A. However, they appear together in Mark’s narrative in order to put Jesus in an apparently impossible position, because whatever answer he gave would alienate him from one group or the other. The King has power; the state has power, and ostensibly, as our children’s story today showed, such power is often experienced more acutely and more directly than is the power of God. But, the ultimate crime against conscience is the deifying of state power, the confusion of jurisdictions which occurs in all kinds of totalitarian regimes, from the right and the left, and two of the twentieth century’s most notorious attempts to do this were made by men born under Capricorn – Mao Tse Tung (born December 26th, 1893), and Joseph Stalin (born January 2nd, 1880). 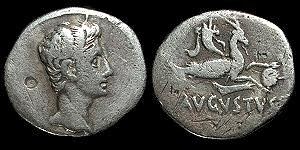 We can assume that Augustus was long dead when Mark was writing, but it is quite possible that this Augustan denarius was still seen as a symbol of imperial power, since Augustus was the first of the Roman emperors, and the one under whom Roman rule in Palestine was consolidated. However, we might also note that the emperor Titus, who was born on 30th December, also issued a denarius with Capricorn on the reverse in 79 C.E., and, as far as I am aware, these are the only Roman coins with zodiac signs on them. We seem to have been a little hard on Capricorn this morning, associating it with authority, gloom, coldness, seriousness, industriousness, inflexibility, ambition, and the like – even its virtues seem like vices! - but we have to remember that somebody has to provide structure for society in order to prevent it falling into anarchy, and so we can be thankful that the world contains people who are prepared to shoulder this onerous burden. We just have to make sure that the worst excesses are avoided, and that personal freedom does not become sacrificed to social control. We have to remember, too, that Capricorn, like its polar opposite Cancer, is a sign of reversal. When the sun enters Capricorn on or around 21st December, we have the darkest time of the year. But then it starts to get light again, and Jesus, like all representations of solar deities, is said to be born at this time. In fact, according to the ancients, the enlightened human soul ascends to heaven through the gate of Capricorn. The symbolism is clear: at the darkest time of the year, the light is born anew. Kahlil Gibran, St. Theresa of Lisieux, St. Bernadette Soubirous, Paramahansa Yogananda, Albert Schweitzer, Alan Watts, were all born under this sign and these, along with countless other Capricorn natives, have reflected the light of the spirit just as effectively as natives of less sombre signs.